"Summer afternoon... the two most beautiful words in the English language." Sunday we spent the day in Seattle. Our first stop was Fremont where I spotted the perfect school bag. Ever since receiving my acceptance letter from SCAD I've been searching for the perfect bag. Originally I had been considering a tote bag for school, but realized they were a bit impractical. The bag I ended up purchasing is a kelly green Jack Spade Greene Street messenger bag. At first I thought I'd go with black, but the salesgirl convinced me that kelly green might go over better in the South. The bag was originally $100 but happened to be on sale for 25% off. So I got it for quite a steal. Next we went for brunch at Cafe Campagne. The owner of my favorite store, Great Jones Home, was seated at a nearby table and gave me a little wave. I ordered the Croque-savoyard (Parisian ham and Gruyère with vine-ripe tomatoes) which was marvelous along with champagne. The only unfortunate thing was that it was so bloody hot and the restaurant did not have AC. At the market I picked up some of my favorite hazelnuts and discovered some really delicious strawberry rhubarb jam. The market was filled with such beautiful flowers for so cheap but I knew I wouldn't be home till late and unfortunately they'd just melt in the heat. After the market we went to Nordstrom to pick up some makeup I'd run out of. A representative from Anastasia was in the cosmetics department doing eyebrow waxing and shaping. So I decided to get mine done and they turned out amazing. I was so thrilled with the results that I went ahead and purchased the "All About Brows" brow kit by Anastasia. From downtown we went to University Village. We had twenty minutes in Crate and Barrel to find the perfect wedding gift for my step sister Kat. I found the perfect present and suprisingly I even had enough time to pick up a box of Ina Garten's Barefoot Contessa coconut cupcake mix. Then we headed to Chateau Ste. Michelle to attend another outdoor concert. This time it was Pink Martini (somewhere between a 1930s Cuban dance orchestra, a classical chamber music ensemble, a Brasilian marching street band and Japanese film noir is the 12-piece Pink Martini). They were just brilliant. It was such a perfect evening. There are peacocks at the winery that just wander around and one managed to find its way over to where the concert was taking place, it was so beautiful. The winery also offers a vast array of food and drinks that one can purchase if you haven't packed a picnic. I just had to have the blackened salmon caesar salad it was so delicious last time. We've finally settled on book three for Blogger's Book Club. We decided to go with Tete-a-Tete: Simone de Beauvoir and Jean-Paul Sartre by Hazel Rowley. They are one of the world's legendary couples. We can't think of one without thinking of the other. Simone de Beauvoir and Jean-Paul Sartre -- those passionate, freethinking existentialist philosopher-writers -- had a committed but notoriously open union that generated no end of controversy. With Tête-à-Tête: Simone de Beauvoir and Jean-Paul Sartre, distinguished biographer Hazel Rowley offers the first dual portrait of these two colossal figures and their intense, often embattled relationship. Through original interviews and access to new primary sources, Rowley portrays them up close, in their most intimate moments. We see Beauvoir and Sartre with their circle, holding court in Paris cafés. We learn the sizzling details of their romantic entanglements. We listen in on their conversations, including the anguished discussions that led Sartre to refuse the Nobel Prize. We witness them as the twentieth century's most controversial public intellectuals. The impact of their writings on modern thought cannot be overestimated, but Beauvoir and Sartre are remembered just as much for the lives they led. 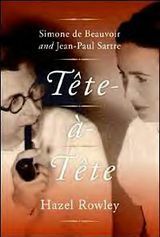 They were brilliant, courageous, experimental, and Tête-à-Tête: Simone de Beauvoir and Jean-Paul Sartre makes us feel the passion, energy, daring, humor, and contradictions of this remarkable relationship. If you care to participate in the book club then pick up a copy of Tete-a-Tete within the next few days and take the month of August to complete the book. Then at the end of August post your thoughts on your blog or if you're sans blog then leave a comment. Several weeks ago while getting dinner in Fairhaven with my friend Alina we stumbled upon a newly opened store called The Paperdoll (located in the Sycamore Square building). Alina and I both were instantly smitten with every single thing including the owner Shultzie Fay's puppy Soupy Sails. "The Paperdoll, a boutique conceived from a deep love for the unique and quirky, is a whimsical adventure of hand-made accessories and independent wares from emerging designers and creative crafters. 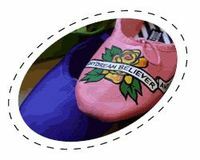 The Paperdoll features products from an ever growing number of local/national and international designers that create imaginative works of functional and usable art." 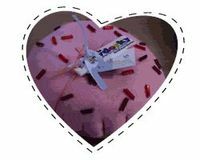 In the fall you'll be able to purchase items through the website but until then check out the designers Shultzie carries and if you see something you like right now then give her a call. The Barefoot Contessa's cupcake mixes have arrived at Crate & Barrel. "Ina Garten offers the simplicity, style and quality she made famous at her Barefoot Contessa specialty food store for your convenience at home." Choose either Coconut cupcakes with cream cheese frosting or Chocolate cupcakes with chocolate frosting. Looks like someone is on her way to becoming the next Betty Crocker. I recently learned that Joan Cusack is set to portray cooking legend Julia Child in a biopic that is currently being filmed. Cusack announced this on Martha Stewart's show, and Martha mentioned that she would love to make a cameo appearance in the film about her idol. I actually think this is really interesting casting. Joan resembles Julia and how about the fact that they share initials. Here's hoping Joan is able to pull off portraying such a beloved icon.